We’ve had a lot of rain this summer, and while that has been terrible for a lot of produce, it has been terrific for my herbs. I have tons of herbs and have been adding them into just about every dish we eat. But now that cooler nights are getting closer, I’m worried about what it will do to my basil. Basil is a tender herb and is super sensitive to cold weather. So, before the basil reaches its impending demise, I want to save as much as I can for use throughout the winter. 2. If you’re going to serve pasta, cook the pasta, drain it, and add a cube to the pan. The warm pasta will melt the cube, then stir and serve. 3. After steaming veggies, add a cube of pesto to the top, cover, and stir just before serving. 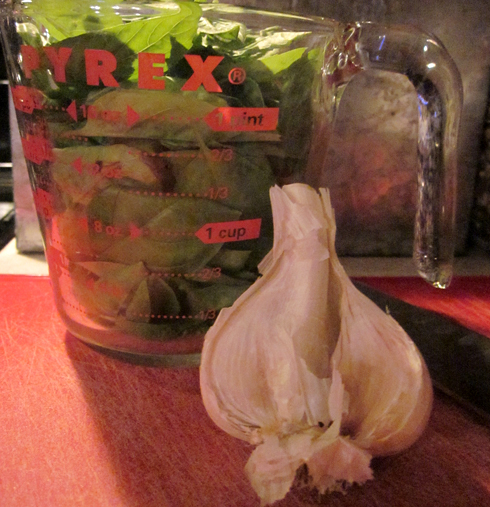 The steam provides a quick way to melt the pesto. 4. After cooking shrimp or chicken in a pan, reduce heat to low and add a pesto cube. Stir and serve. 5. Melt a few cubes in the microwave and spread on top of flatout flat bread for a pizza base (in this case, you’ll want more than one cube per serving). 6. Set at room temperature for a few hours to thaw, then mix with cream cheese for a really delicious topping for a bagel or to use as a sandwich spread. 7. Throw into a batch of mashed potatoes. 8. Add toasted pine nuts and grated parmesan, serve on top of diced tomatoes and zucchini for a flavorful side. Place half of basil and all of the remaining ingredients in a food processor. Pulse until reduced, then add remaining basil (in batches if necessary). Pulse just until no large bits remain. 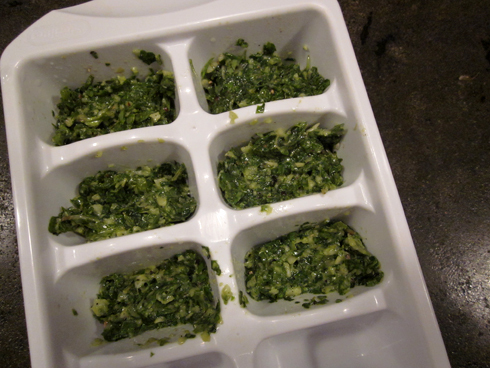 Spoon into an ice-cube tray, approximately 1-1/2 to 2 T. per cube. Place in freezer and freeze overnight. Remove each cube and place in a ziplock bag or freezer container. To help avoid freezer burn, wrap in waxed paper or tinfoil before placing in the container. There are two things I use a lot in the kitchen, and especially when I make pesto – I love them, and I think you might too. Garlic Peeler: Basically a rubber (or maybe silicone) tube that makes peeling garlic a breeze. 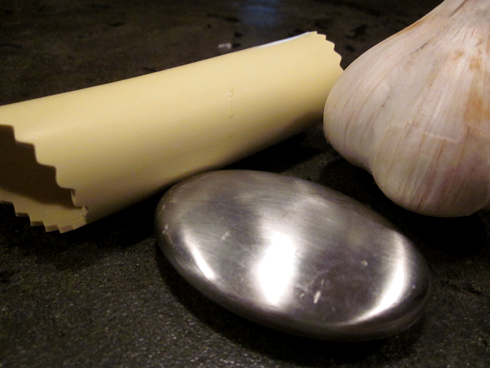 Simply place the garlic clove in the tube then roll it on a flat surface pressing down with your hand. With a tap on the countertop, the clove rolls out and leaves the garlic paper behind. So slick. They can be found at all kinds of kitchen stores, and here. Stainless Steel Soap: After making anything with garlic, the smell can stick around on your hands for a while. This stainless bar of soap works scent-removing miracles simply by using it to wash your hands as if it were an actual lathering bar of soap. Run your hands under water and wash your hands with this bar, and the scent GOES AWAY. Also, it feels like you’re “playing washing hands” because it is weird to wash up without any lather, but dude it works. Also found at kitchen stores, and here.